Update: This article refers to the old Eclipse based method for developing Android apps. The Android Studio development environment does not appear to have the problem reported in this article. Therefore this article is now archived and kept for historical purposes only. At Tek Eye our machines are built for performance, shaving seconds of the program – compile – test cycle saves hours over the month. Machines have a small solid state drive (SSD) for the Operating System (Win 7 x64) and a big hard disk drive (HDD) for programs and work data. So Win 7 is on a C: drive and everything else on a D: drive. All users' special folders are relocated to D:. For Android development Eclipse is installed with the Android Development Tools (ADT) Plugin onto the D: drive. A lot of the initial development of an App is done using an Android Virtual Device (AVD). The AVD is set up using the AVD Manager. Once set up an AVD allows an App to be launched onto it via the Eclipse Run or Debug options. Unfortunately on some configurations where the user folders are on the D: drive, an error is reported when an AVD tries to start (even if the AVD Manager successfully created the AVD). 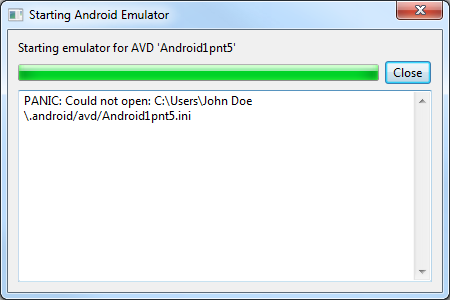 A Starting Android Emulator dialog appears with an error message similar to PANIC: Could not open: C:\Users\Name.android/avd/AVDName.ini. When debugging or running Apps ADT is trying to load the emulator from C: when it, and the configuration files for it, are on D:. One solution is to use a NTFS symbolic link, a.k.a a symlink. Setting up a symlink can fix the above error. 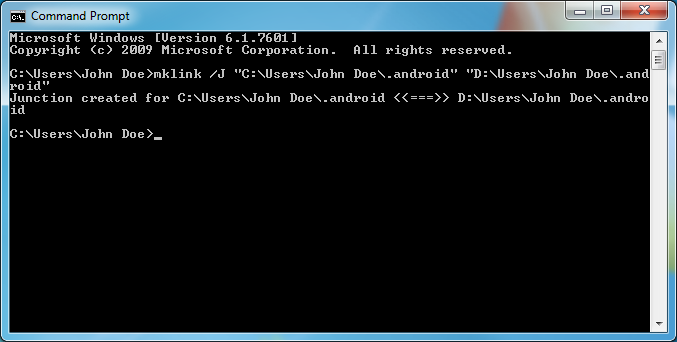 mklink /J "C:\Users\John Doe\.android" "D:\Users\John Doe\.android"
Now when the ADT plugin is trying to reference .android on C:, NTFS redirects the request to D: and the emulator starts correctly. For programming tutorials using Android Studio see the Android Example Projects page. Nice one. What do you do on WinXP (does not have mkLink)??? As stated in the post Windows XP can use the Junction utility from the Windows Sysinternals web pages. Thanks I can make mklink folder.